Acer's All-in-One. Notebook, tablet or All-in-One PC, the Acer R13 meets almost all the requirements. Thanks to the new Ezel Aero Hinges, the device can be used in many operating modes and is also really fast with its two turbo SSDs in a RAID 0 configuration and Intel's i7 processor. 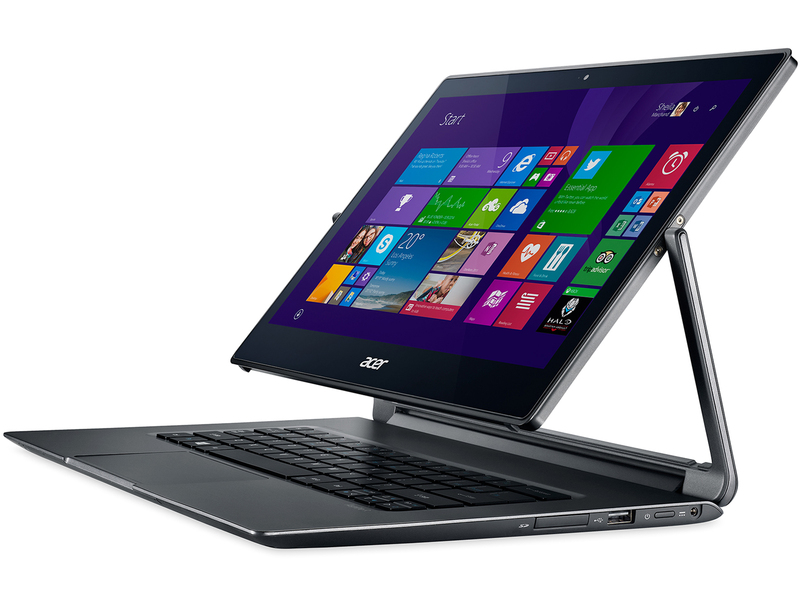 Model: The Acer Aspire R13 R7 is a convertible tablet which can also function as a laptop. Thanks to the Ezel Aero hinge, the screen can be adjusted into six different positions including stand mode, tablet mode, tent mode, notebook mode, ezel mode and display mode. Each operating mode has its own unique features whereby the screen can be turned along a longitudinal axis. The flexible display is 13.3 inches wide with a resolution of 2560 x 1440 pixels. It is a multi-touch screen that can accommodate up to 10 finger contacts. It is about 25.4 mm thick but only weighs 1.5 kg. Since the device is almost entirely from plastics, it can stay so light despite being on the thick side. The only metal incorporated within the structure are the two support beams of the screen and the display frame. The processor here is an Intel Core i7-4510U with a speed of 2GHz which comes with an Intel HD Graphics 4400 card and 8 GB LPDDR3 memory. There is also a stylus pen that allows you to doodle or scribble on screen when it is in stand mode. Overall, this Microsoft Windows 8.1 convertible is possibly one of the more flexible innovations of recent years.